Details on how to win a copy of this book at the end of the review and a link to purchase it. Vintage clothing store owner Cookie Chanel should have felt right at home during the fashion shoot for Fashion and Style magazine. Sure, the Halloween-themed photos were being taken in the middle of a Sugar Creek, Georgia, cemetery, but being able to communicate with ghosts and having her own spectral BFF had Cookie accustomed to the spooky atmosphere. That doesn’t mean that she still isn’t startled to meet yet another ghost, or hear gunshots that signal the death of the aggressively obnoxious photographer, Tyler Fields. Her adorable clothing indicates that Minnie Lynn lived her life in the 1920s, making her presence probably unrelated to Tyler’s modern-day murder. She’s more than willing to join Cookie and her constant ghostly companion Charlotte Meadows on their investigation, who doesn’t hesitate to introduce Minnie to the questionable use of Catfishing. Cookie’s studly boyfriend Detective Dylan Valentine warns them away from his investigation, but he also has something of a roll-with-it attitude as he accepts not only the ghosts but Cookie’s compulsion to meddle in murder and occasionally hide evidence. 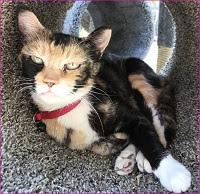 A new development is Cookie’s living best friend Heather’s ability to finally see ghosts as well, a handy talent for a formerly-fraudulent psychic. While Minnie and Charlotte are often the cheerleaders for Cookie’s life-endangering endeavors, they often lean towards being a version of the jeering Muppets Statler and Waldorf as they narrate and critique Cookie’s activities. A far more effective investigative duo comes in the form of Vintage Y’all’s store cats, Wind Song and a newly arrived feline. Embodying the spirit of Cookie’s grandmother, Wind Song utilizes tarot cards and a Ouija board to provide clues and warnings. Cookie and Charlotte provide fashion and ghostly living tips at the beginning of each chapter, with additional vintage designs gorgeously described throughout. She also includes in the back of the book the Blog Post from Cookie Chanel, Vintage Bags That Never Go Out of Style. This is fun romp of a mystery that delights with its impulsive heroine, quippy banter, and tantalizing romance. 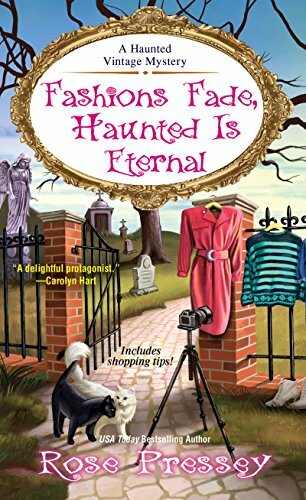 To enter to win a copy of Fashions Fade, Haunted is Eternal, simply email KRL at krlcontests@gmail[dot]com by replacing the [dot] with a period, and with the subject line "fashions,” or comment on this article. A winner will be chosen February 16, 2019. U.S. residents only.If entering via comment please include your email address. You can read our privacy statement here if you like. Check out other mystery articles, reviews, book giveaways & mystery short stories in our mystery section in Kings River Life and in our mystery category here on KRL News & Reviews. And join our mystery Facebook group to keep up with everything mystery we post, and have a chance at some extra giveaways. And check out our new mystery podcast featuring mystery short stories and first chapters read by actors! A new episode went up this week! Really like the Vintage clothing store storyline. Looking forward to reading. You are the winner. I just sent you an email as I need your mailing address to send out the book. Rose Pressey is one of the best authors in the cozy mystery genre. Cookie seems like a character that's lots of fun.